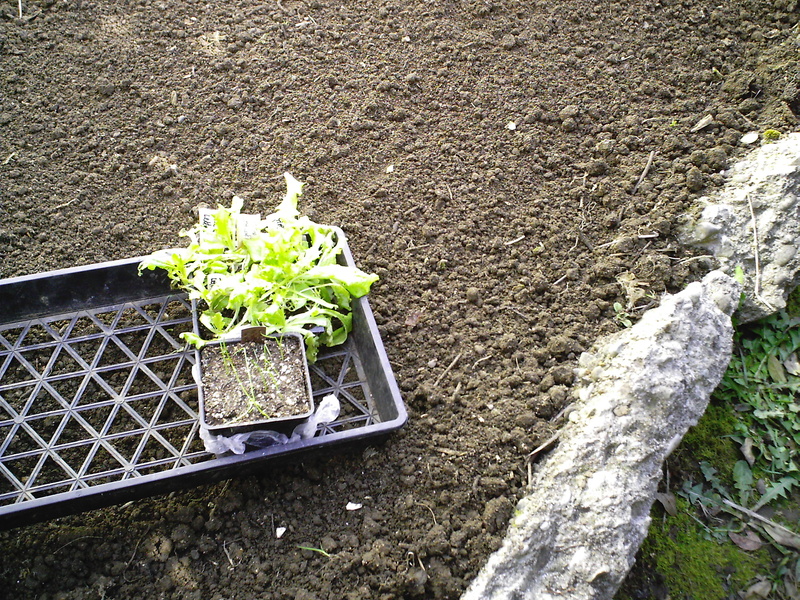 Lovely weather–finally!–on Friday and Saturday here, and so I got outside and got busy by preparing and planting a lettuce bed. I had lettuce starts as well as a few baby Walla Walla Sweet onion starts that I had grown indoors under lights from seed, and I had been hardening them off for about three weeks (didn’t need to do it for that long, but it was so cold and rainy I never could get them planted until now.) Anyway, here is the process I use, which originates with Steve Solomon’s method in his book, Gardening When It Counts. The first step is weed removal. Last year in this spot I had tomatoes planted, so the dirt was pretty friable from the tomato’s extensive roots loosening it up for me, so it didn’t take too long to weed it. 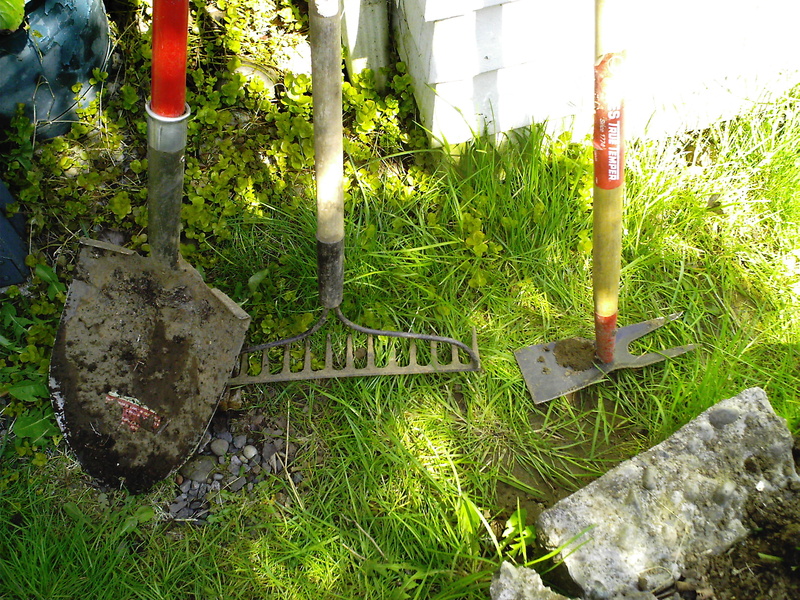 These are the tools I used for this project: shovel, metal rake, and a two-in-one tool that is great for breaking up the soil, hoeing in between rows of plants, and weeding. Plus I used a measuring tape and a small hand shovel. Next I applied fertilizer. 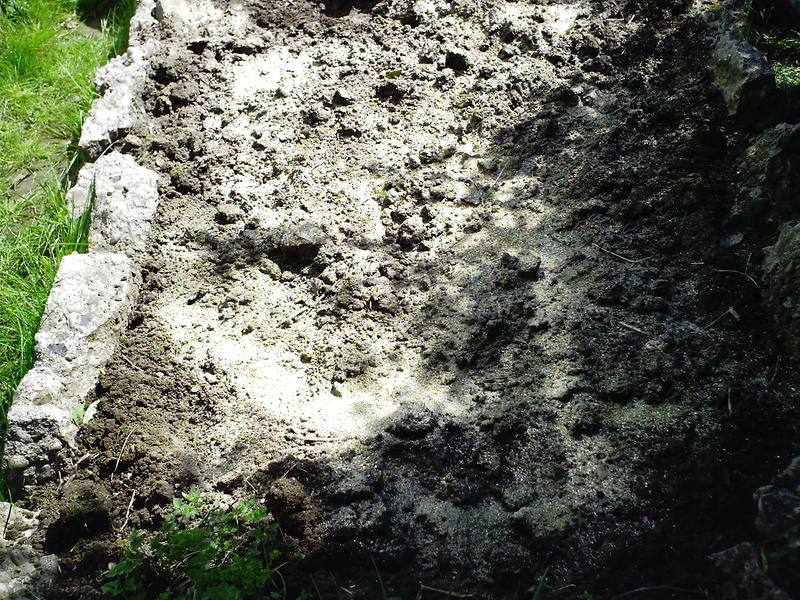 This is complete organic fertilizer that I mix myself–Solomon’s recipe is 4 parts seed meal, 1 part dolomite lime, 1 part bone meal, and 1/2 part kelp meal. 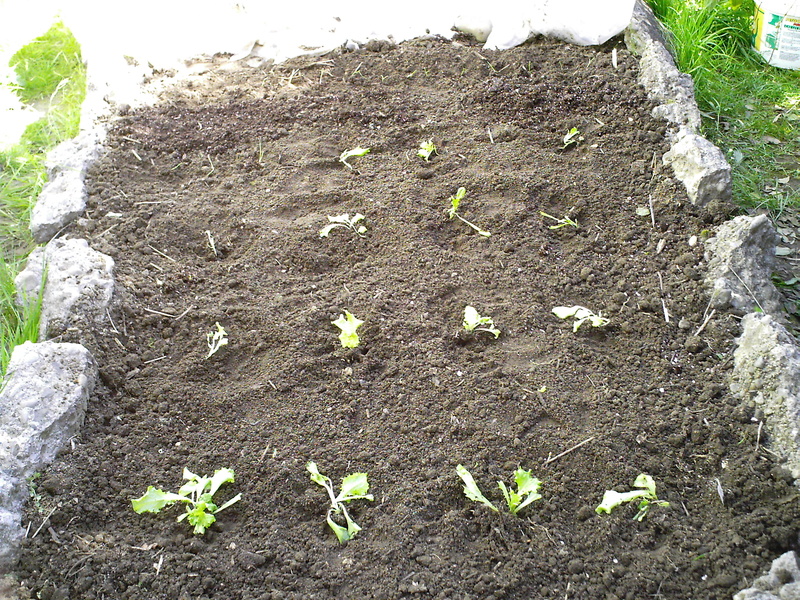 This bed is about four feet wide by six feet long, and because lettuce needs highly fertile soil to grow well, I put 1 and 3/4 quarts of fertilizer on the bed. 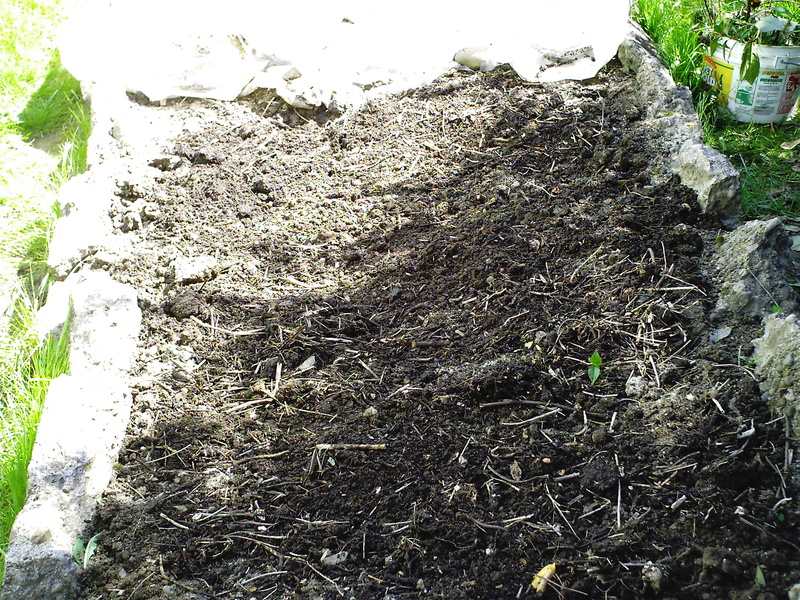 Next I placed a 1/4 inch-thick layer of homemade compost on top of the fertilizer. 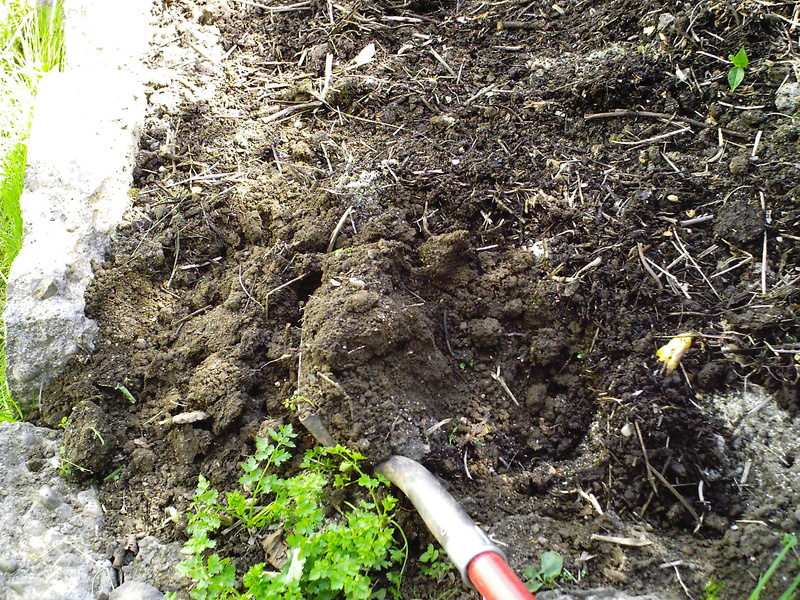 This compost is wonderful–full of worms to take all this wonderful stuff down into the soil. I wish I had five-times the amount of this stuff, but can only produce so much with my available resources. 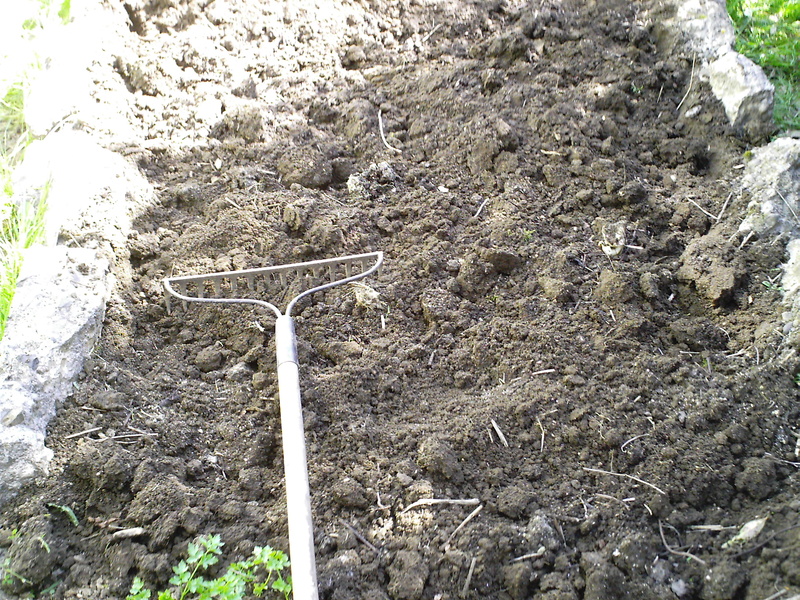 After digging, the bed is lumpy and not level, so I use the metal rake to break up large clumps and get the bed level and as smooth as I can. 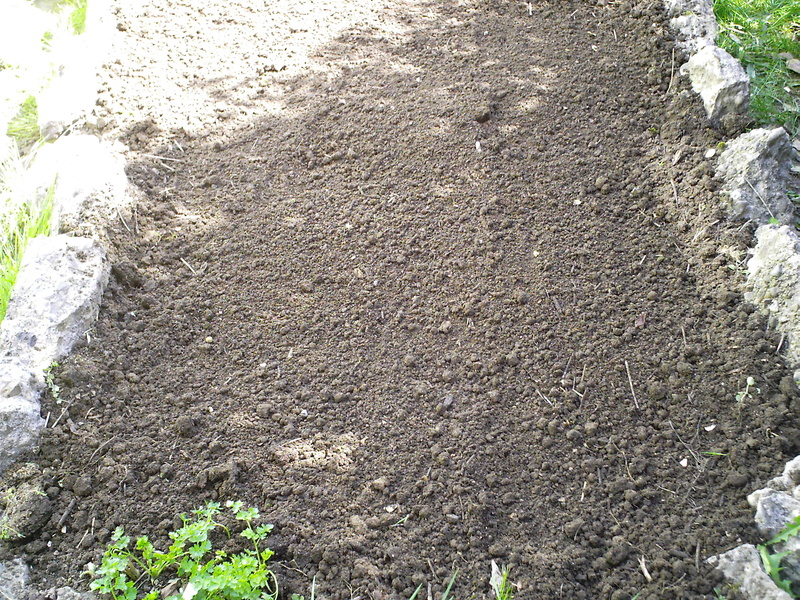 Now it’s smooth and ready for planting lettuce and onion starts. It’s still a little too lumpy if I was wanting to plant seeds, however, so a little trick I like to use is to put seed-starting mix just in the rows where you’ll plant the seed, and that way they have no trouble germinating and coming up through that light and airy mix, and by the time they get big enough they can reach down into the regular soil to expand their roots. The lettuce and onion starts. I am planting ‘Two Star’ looseleaf lettuce, ‘Bullet’ green romaine, ‘Red Iceburg’ crisphead, and ‘New Red Fire’ looseleaf lettuces, plus a few ‘Walla Walla Sweet’ onions and a very few ‘Pacific Pearl’ scallion/bunching onions to finish up a little bit of seed I had leftover from last year. 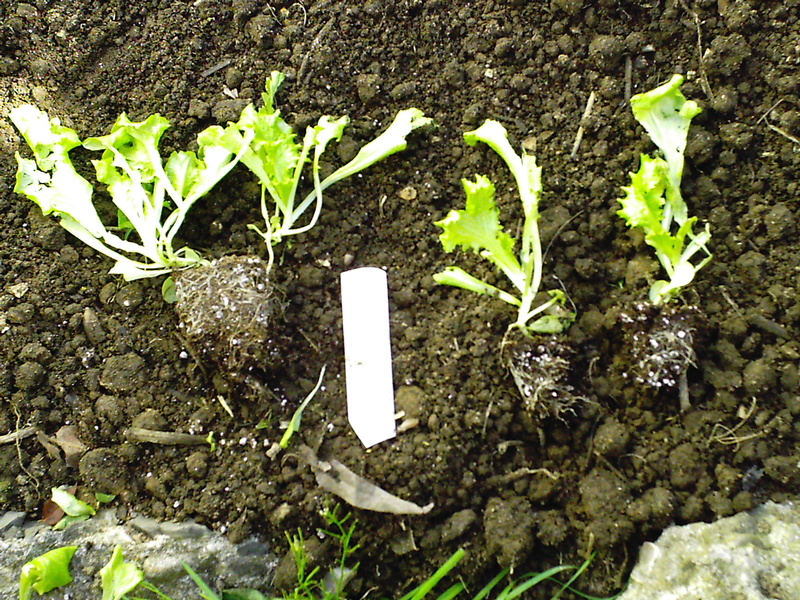 The lettuce starts are in a 6-pack, and the onion starts in a 4-inch container. I started the seeds indoors back at the end of February. Since I put two seeds into each 6-pack cell, and the seed is new and fresh, I had good germination and got two plants per cell, mostly. So I carefully separate the baby plants, making sure both lettuce starts have their root systems intact as much as I can. This is ‘Two Star’ looseleaf. 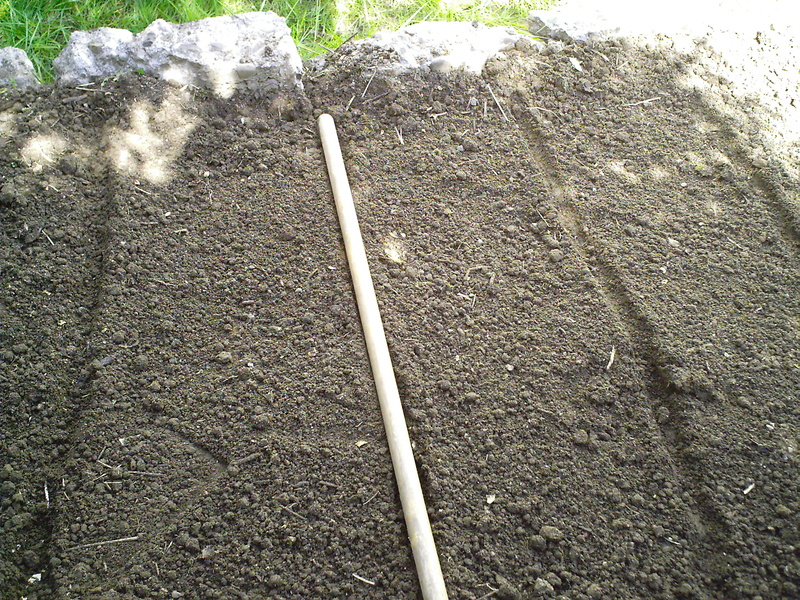 I use the rake handle to press into the soil to make straight lines indicating the rows where I will plant the lettuce and onion starts. These rows are about 12 inches apart. 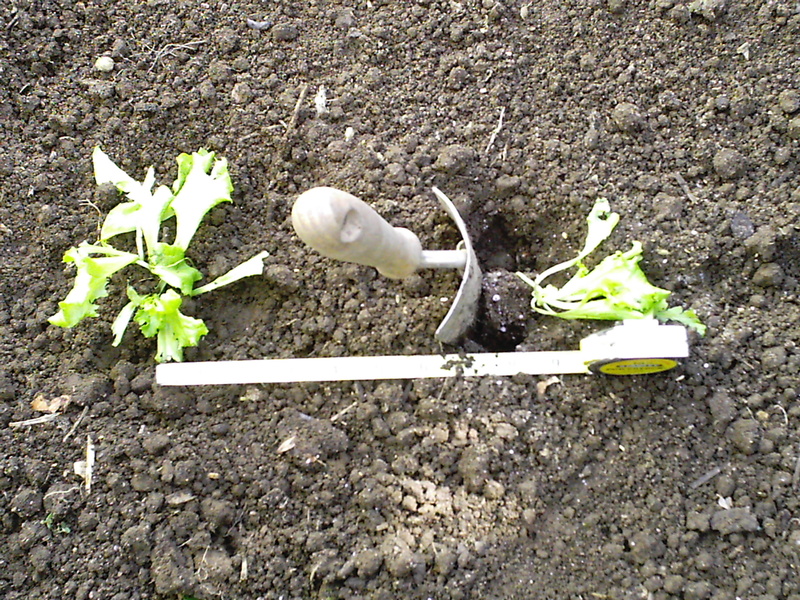 Then I plant the starts using a small hand shovel. I planted them about 9-10 inches apart on the row, so I got four plants on a four-foot long row. The onions I planted 2 inches apart, because I can thin them at the green onion stage to use for cooking, so it’s okay to plant them closer. The finished lettuce and onion bed. After this, I carefully watered them in, and sprinkled Sluggo around the plants, because these babies are like ambrosia to slugs. 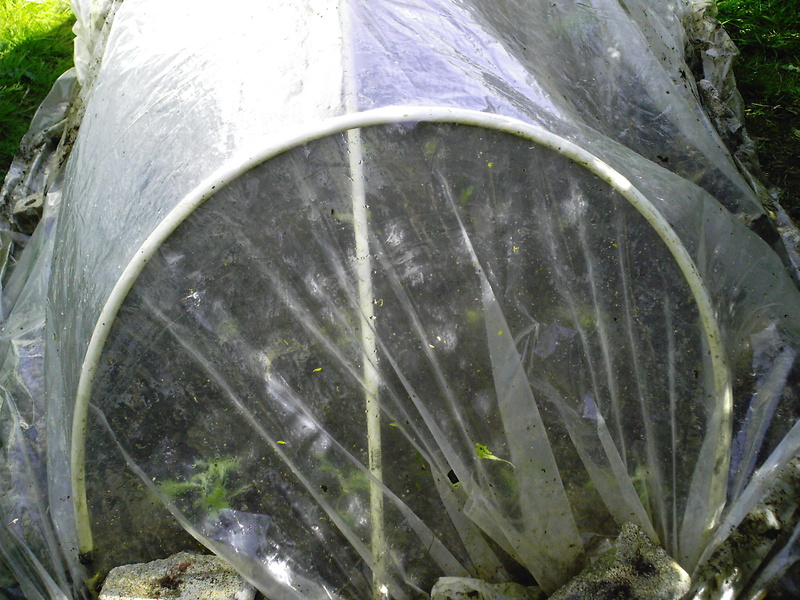 Because our weather patterns are imitating Siberia for as long as possible this cold and rainy spring, and it may go down below 40 degrees at night–the lowest night temperature at which lettuce will grow–I went ahead and covered the whole bed with pvc plastic hoops and clear plastic held down with rocks at the edges. That’s it. 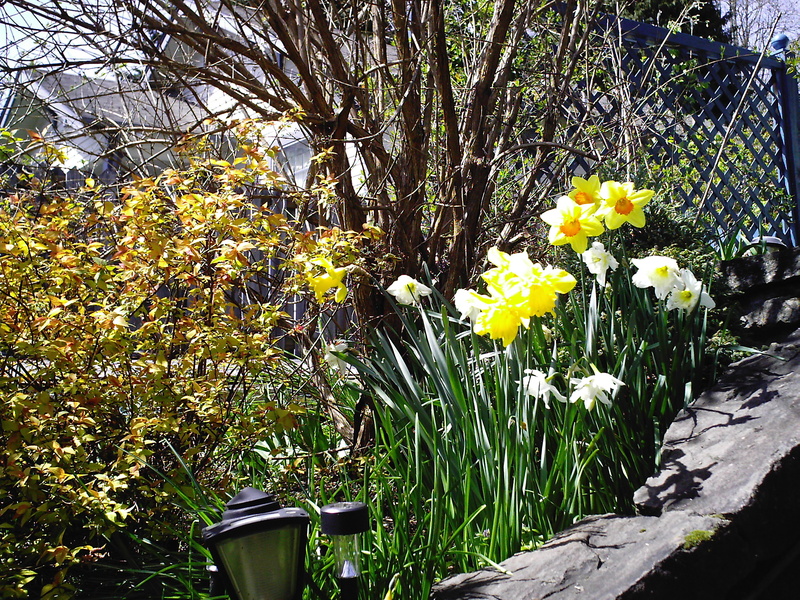 Did you have fun in the sun in your garden this past weekend? Do tell in the comments. And visit the Garden Party. Cozy Garden Seating Areas Talk Is Tomorrow! I’ve been invited to speak at the Camas Public Library Gardening Series, so if you are in the area please come! 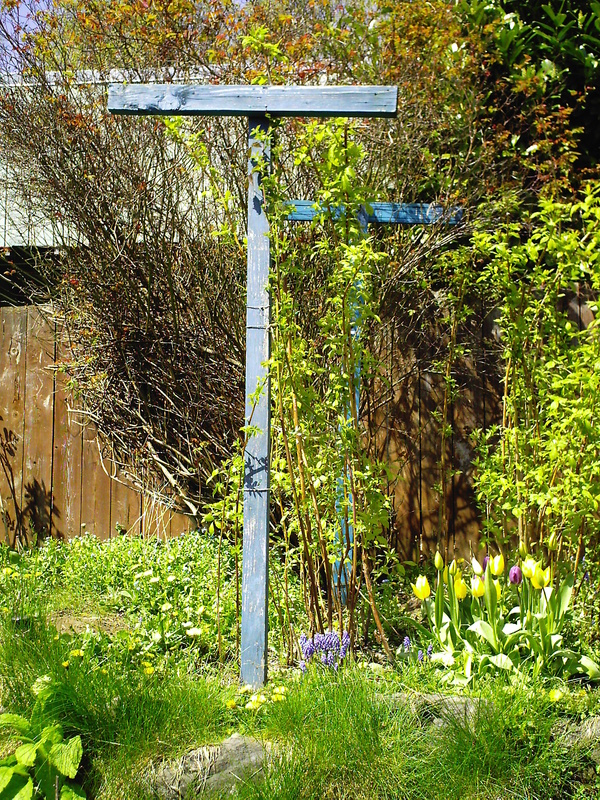 It’s a free event, and all who are interesting in gardening topics are welcome! Why: The talk will cover creating cozy and intimate seating areas in your garden–it’s free and it should be a lot of fun! 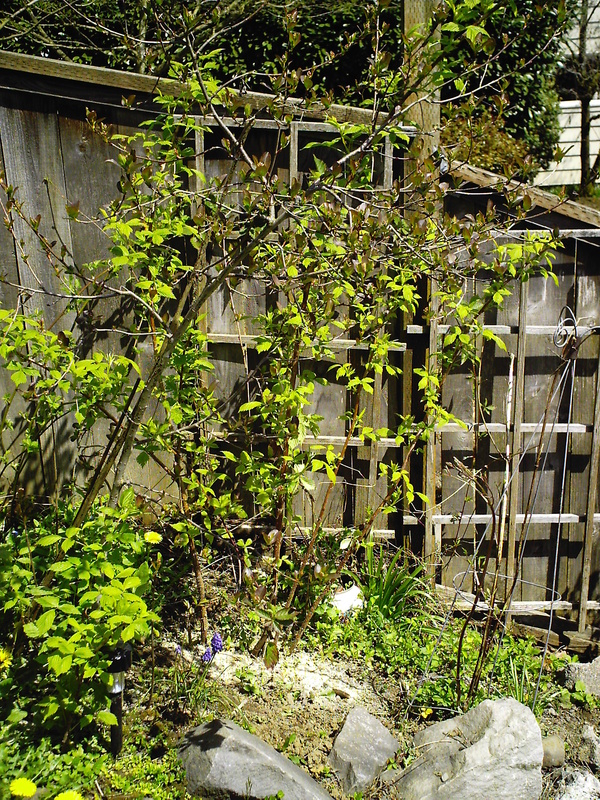 So we had this situation in our backyard: when we moved into our house, there was a large maple growing in the backyard at the fenced edge of the property. The tree was 40 feet tall, but it was a scrubby tree that should have been removed years ago, but problem was nobody did. So we had this tall and scrubby tree. Over time, and in my zealous pursuit of expanding my gardening space, I managed to disturb the tree roots enough that I killed the tree. So then in time we had a scrubby maple that was also dead, and now it was a hazard if it were to come down in a wind storm. Solution: Our nice neighbors came over and carefully cut down the tree in sections for us. We cut up the wood for firewood, hauled off yards of limbs and tree roots that we dug up over time. Problem: We still continue to this day to have the tree stump in place. Right after the tree was cut down to ground level, I made a compost pile on top of it, to try to rot it out. After 4-5 years, the edges of the stump have rotted a little, but the center is still pretty solid. After looking at it, it was decided that there was no practical way to remove this particular stump. I asked about burning it, but Joe said that even if we had the stump completely removed from the ground, it would take a very long time to burn it because it is full of compacted soil. Chemicals, which are highly toxic and not good to use around pets, children, or organic vegetables, are not really effective in breaking down the stump either. The smallest stump grinder requires three men to lift it into position, and that is if you can get it up flights of stairs and narrow pathways. 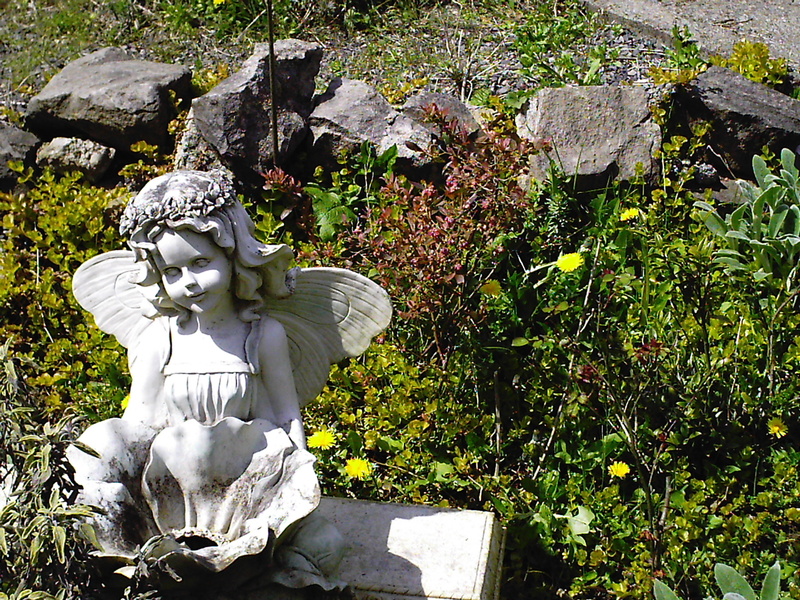 Joe said to try to work it into the landscape, perhaps by placing rocks on top and putting a container of flowers or garden art on top. Or by placing large rocks around it and filling the indentation with soil to create a place to plant. Sometimes you have to have an objective person come out and take a look at the garden to give you a realistic answer to a question you have about it. And now my wheels are turning, and I’m coming up with other ideas for the space than I had originally planned. I wanted to grow a row of arborvitae shrubs along the fenceline in order to provide more privacy, which is needed in that area of the property. I think I still can, but the shrubs will now have to be placed around the stump. However, it could be really cool to place some garden art in between the shrubs, using the shrubs as a partial backdrop, which will help set off the art. Now we have to remove a large rhodedendron from this fenceline to another location on the property, which unfortunately will be a big job because I suspect it will have a very large rootball, but then I will have more room for the arborvitae where I want them positioned, so it has to get done. 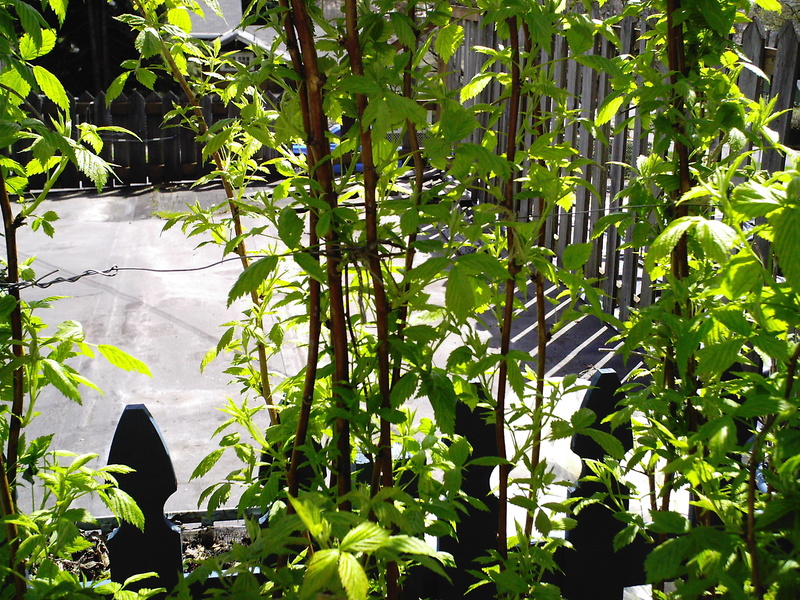 The garden never ends, and there are always new possibilities, aren’t there? Leave a comment if you like–I always enjoy hearing from you! We worked on the raspberry plants a couple of days ago, and I thought it might be helpful to show you how I have them set up. And once I got that idea, I decided to take pictures of all the different types of berries that I grow, so you can see what they look like at this time of year. Generally speaking, plants have been kind of slow coming out of dormancy due to unseasonably cold and rainy weather this year. I saw on a weather report that in a normal year to this point we would have had 17 days of sixty-degree and above weather by now–this year we have had three days. Historic cold temperatures. Anyway, here we go with Berries on Parade . . . 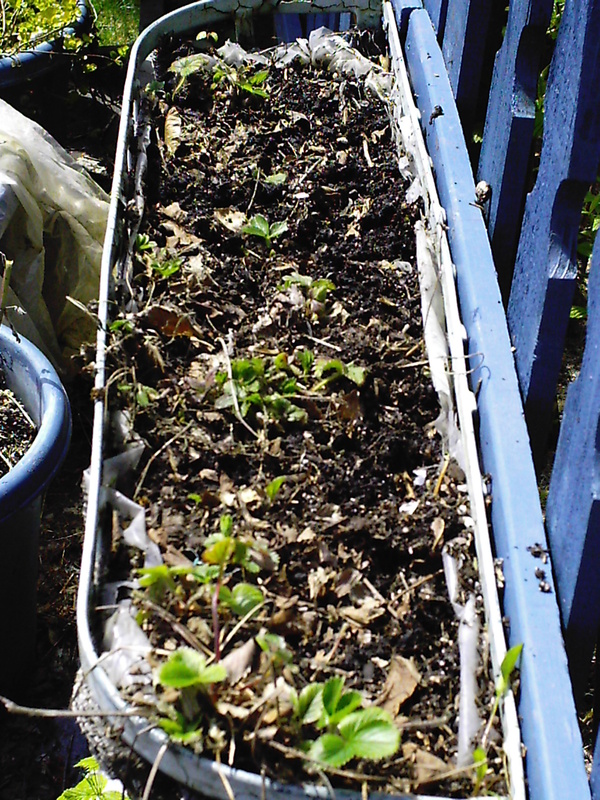 These are strawberries that I grow in a hay rack-style container that hangs on a fence. Slugs tend to devour strawberries when I’ve tried growing them in the ground, so I’ve had better luck growing in containers. 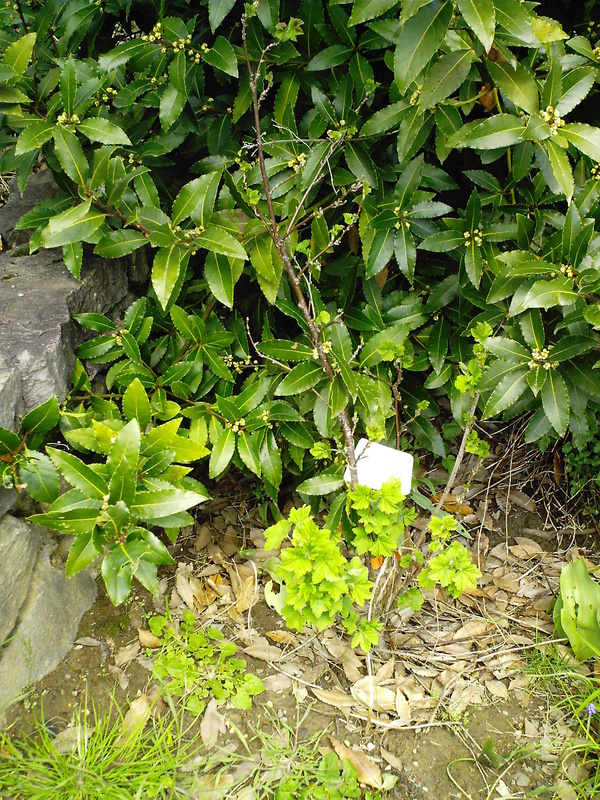 The variety is “Quinalt,” an everbearing variety. 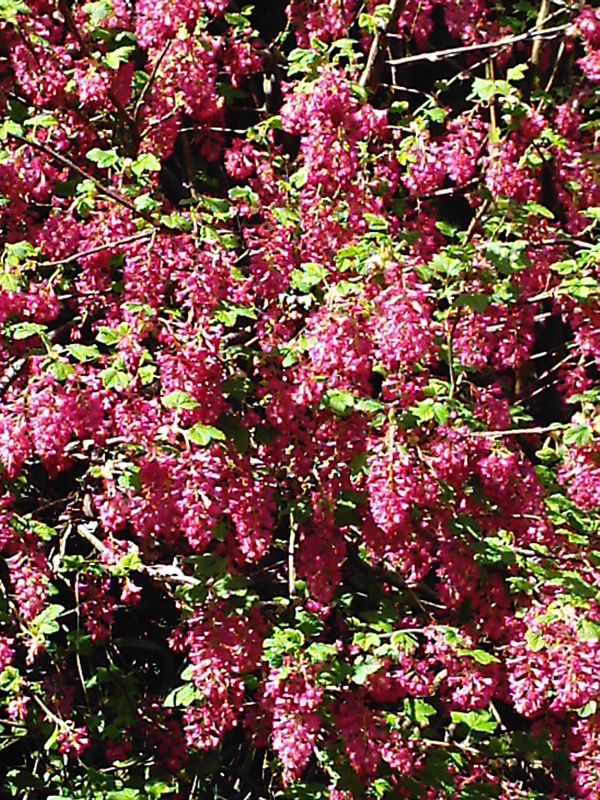 This is a red currant, Ribes rubrum, with a bay laurel tree growing behind it. This would likely do better if it had more sun exposure, but I’m running out of planting room, and so this has to suffice for now. 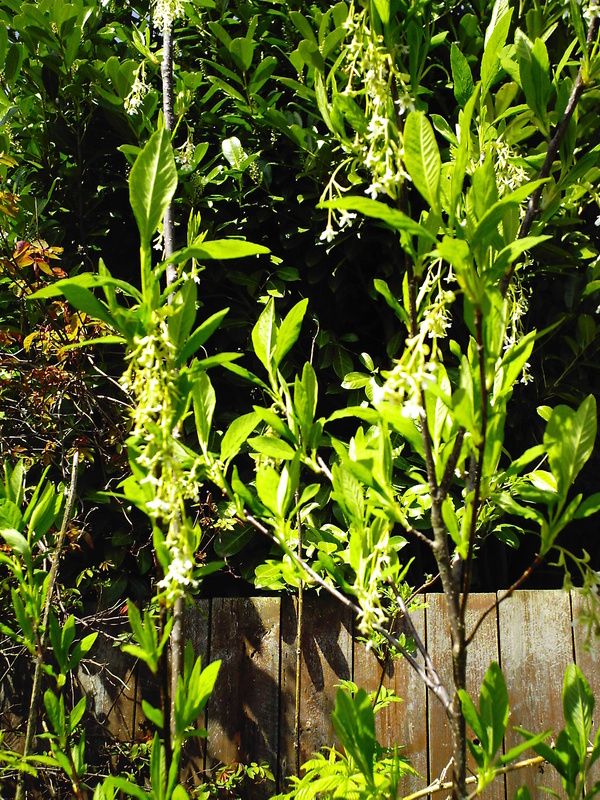 It is a tough plant, has pretty white flowers and bright red berries that can be cooked with sugar to make into syrups to flavor drinks or for pancakes. 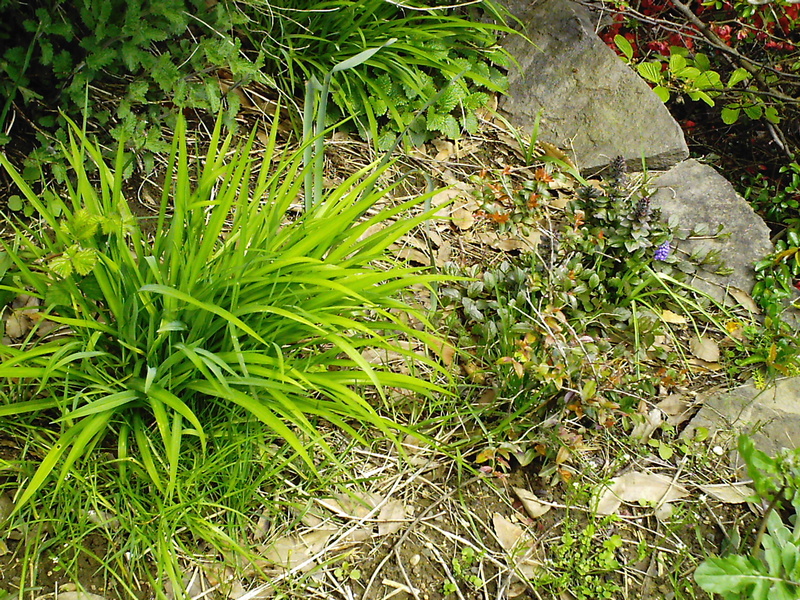 On the right, a Northwest native plant called Evergreen huckleberry, along with a daylily and some ajuga behind it. These are reputed to get quite tall if grown in their preferred shady locales. I am growing it in full sun, and so far it is still teeny. It is truly evergreen, but it’s a young plant and so far has borne no fruit. On some of the next photos, you will see a light-colored granular-powdery substance on the ground. This is a complete organic fertilizer that I use with berries as well as vegetables. 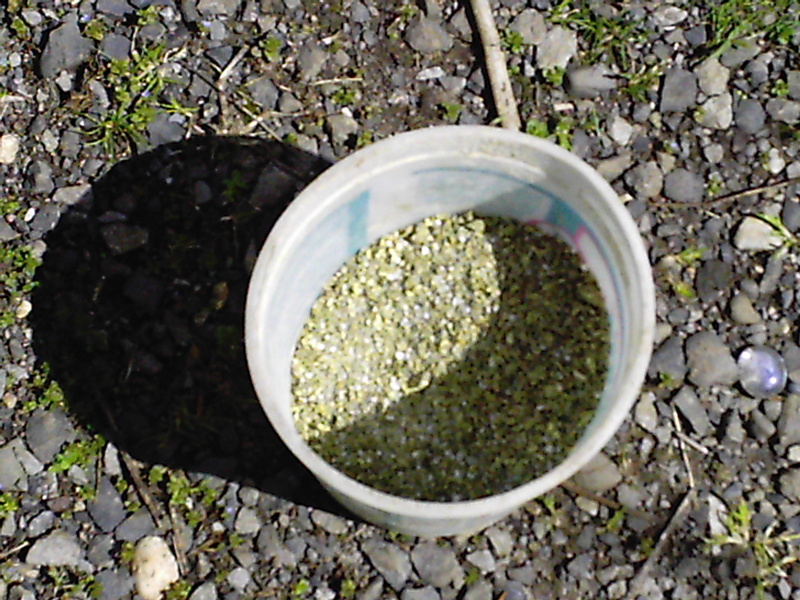 The recipe is from Steve Solomon, and it consists of four parts alfalfa meal (although Solomon recommends a seed meal, I could not find any that were not GMO-crops, and thus it was advised to try the alfalfa meal instead. Of course, legislation just passed allowing mega-agricultural corporations to introduce GMO alfalfa into the food supply, so I have no idea what to try next), one part bone meal, one part dolomite lime and a half-part kelp meal. Mix it all up, and store it in a garbage can with a fitted lid, and you’ll have it dry and on hand when you need it. 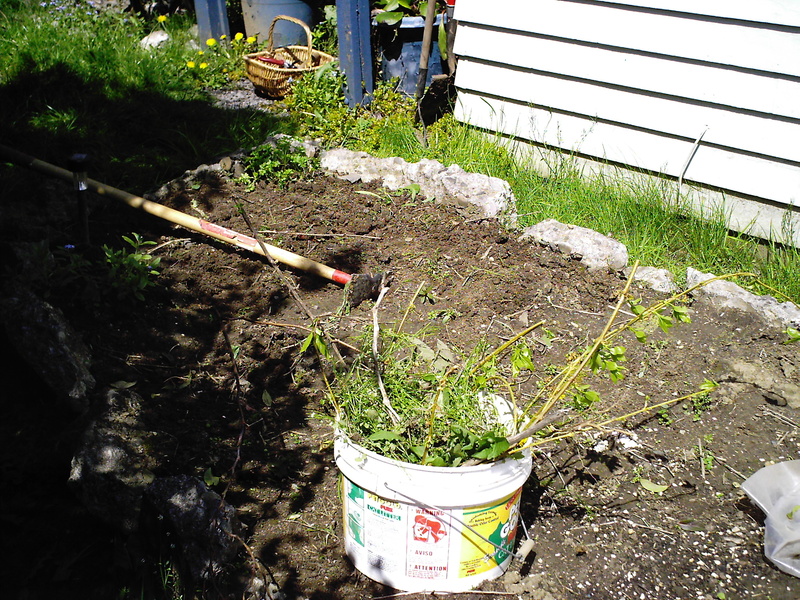 On the left is an Aronia shrub, and behind is a raspberry with fertilizer at the base. 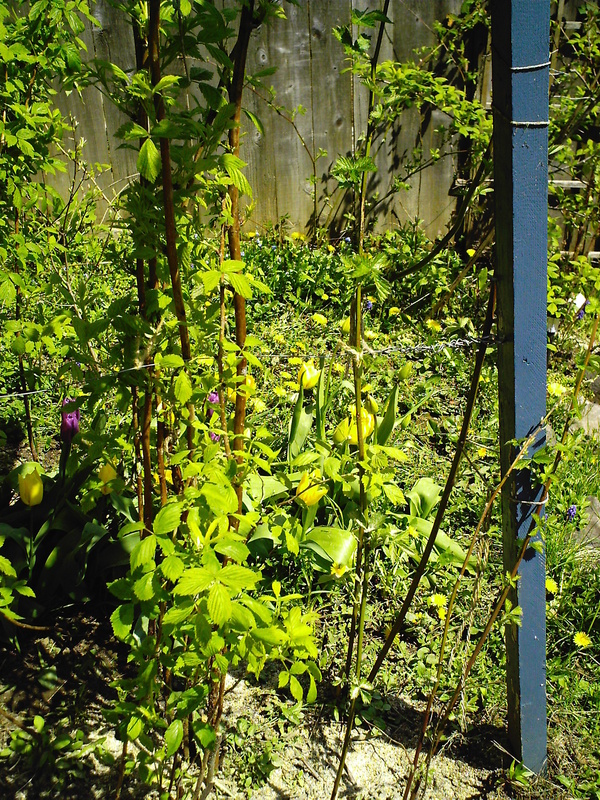 To the right is an ‘Etoille Rose’ clematis that is just starting to put up some new growth. 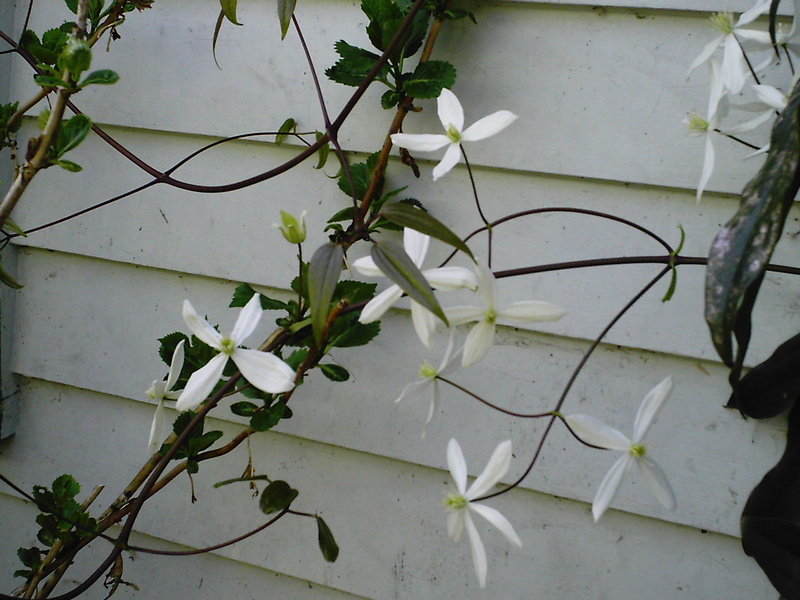 Aronias are great–beautiful white spring flowers, a small shrub loaded with red turning to blue/black fruits that are wonderful cooked and sweetened in summer, and lovely red fall foliage. 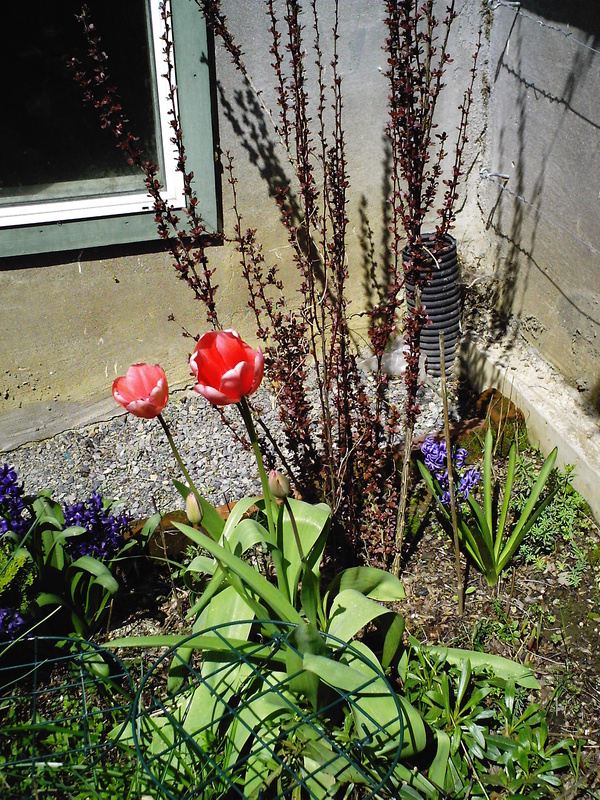 To the right of the fairy statue is a petite ‘Sunshine Blue’ blueberry, which right now sports red foliage, and some flower buds that are pinkish but not really open yet. ‘Sunshine Blue’ is a compact and self-pollinating plant that produces pretty well for me. 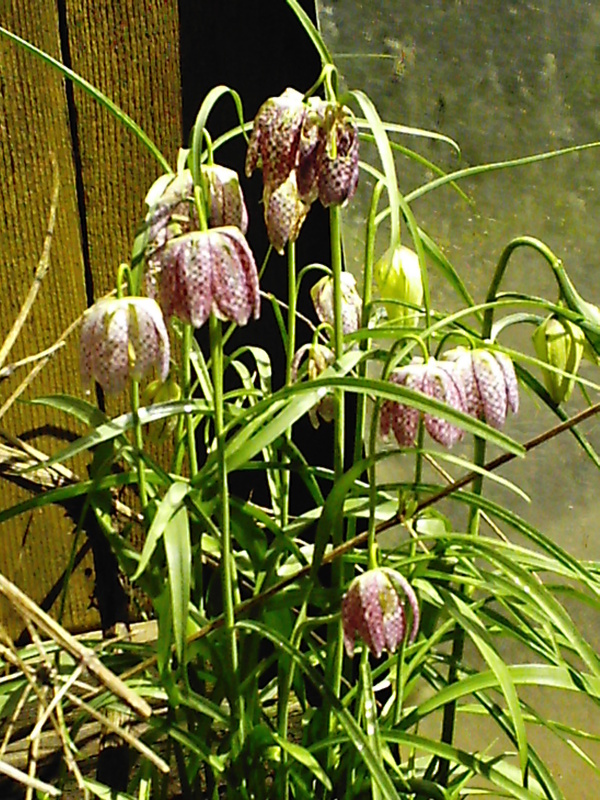 They seem to like full sun growing conditions, and produce more in the sun, than they do in the shade at my garden. This is one example of how to set up raspberry trellis. We just used up scrap wood that we had around, but if you are starting from scratch I recommend untreated wood, cedar would be good, so that the fruit does not come in contact with contaminants. We used eye screws and put 3 spaced along the length of the upright post. Then wire running across, attached to the eye screws. It was not fancy, but works pretty well. Then you plant your raspberries–here I have a mix of June-bearing as well as fall-bearing–and they grow, and you tie the length of the berry cane to the wires, so that they grow upright. These wires are at about two feet from the ground, four feet and six feet. You tie the raspberries to the wires with garden twine. They get tall and when fruiting quite heavy, so having the 3 levels of ties helps to keep the fruit up off the ground, and makes it a lot easier to pick them. 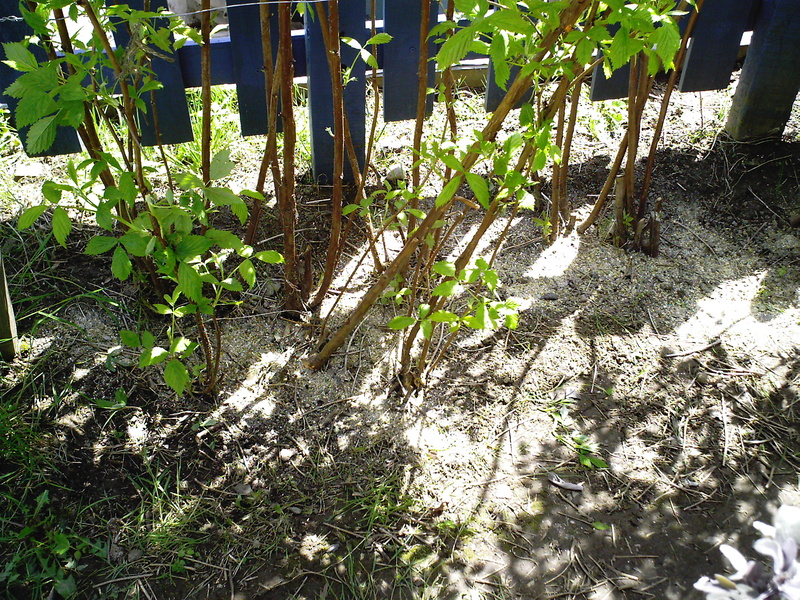 I weeded the raspberry row, and sprinkled on the complete organic fertilizer. This is pretty much the only time of year I fertilize them, and they produce quite a lot. I also pruned them before tying them in to the wires. Really simple to do–just cut the dead stalks all the way back to the ground. The stalks that have green leaves coming out of them usually have a top of the cane that is dead, so just cut off the dead part, and you are good to go. Here is another way to do a raspberry trellis. We were using up scrap wood, and thus this is painted wood, which I do not recommend. I am super careful to keep the fruit away from the painted wood. When it falls apart over time, we will replace it with cedar posts. However, the shape is the important thing here. I learned this from Vern Nelson, who writes the gardening column for The Oregonian newspaper. 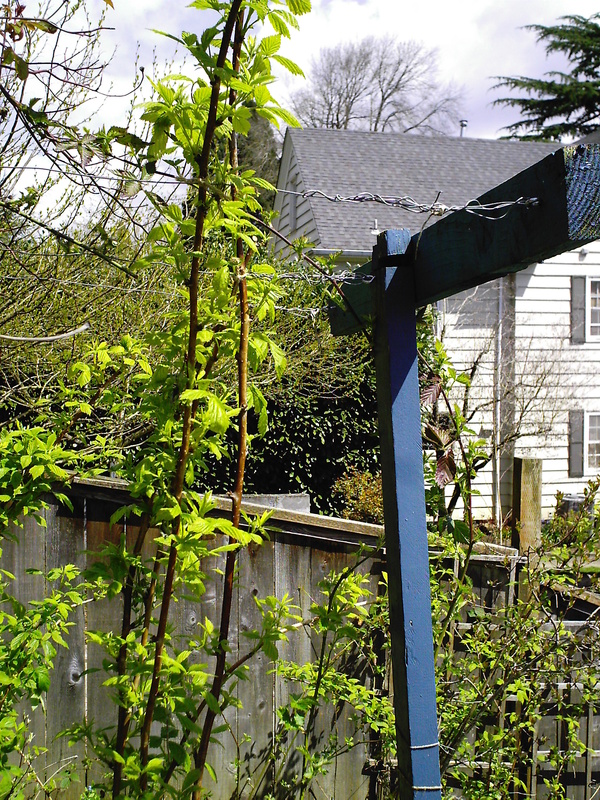 You will need a 8-foot tall post–2×4 is fine, and a two-foot piece for the top of the trellis. Underground where the upright piece is, you will have attached another 2-foot long crosspiece, and buried it underground about 1 1/2 to 2 feet deep. This understory part helps to keep the post upright and not leaning in. Here’s the top of the trellis. There are 3 eye screws in each side of the trellis, and we’ve run wire across the length. I put one wire about two feet off the ground into each side of the main upright posts using eye screws. This gives many places to tie the cane berries in, for ease of picking as well as good air circulation for the plants. 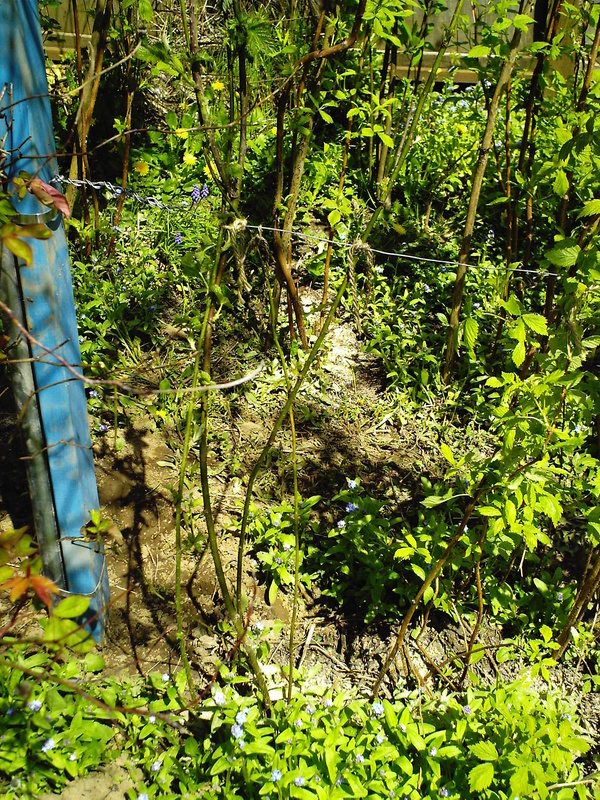 Toward the center/left are Marionberry canes, and to center/right are raspberry canes, with forget-me-not blue flowers in front. I can’t really say that I recommend Marionberries for the home garden. There is a reason why they are so expensive to buy at the store, and that is because this cane produces 20+ feet of cane every growing season and then only produces a handful at best of berries pretty much only at the end of the cane. Boysenberry does the same thing, which is why I replaced it with Marionberry, which I was told doesn’t get as big and produces more fruit. That has not been my experience. 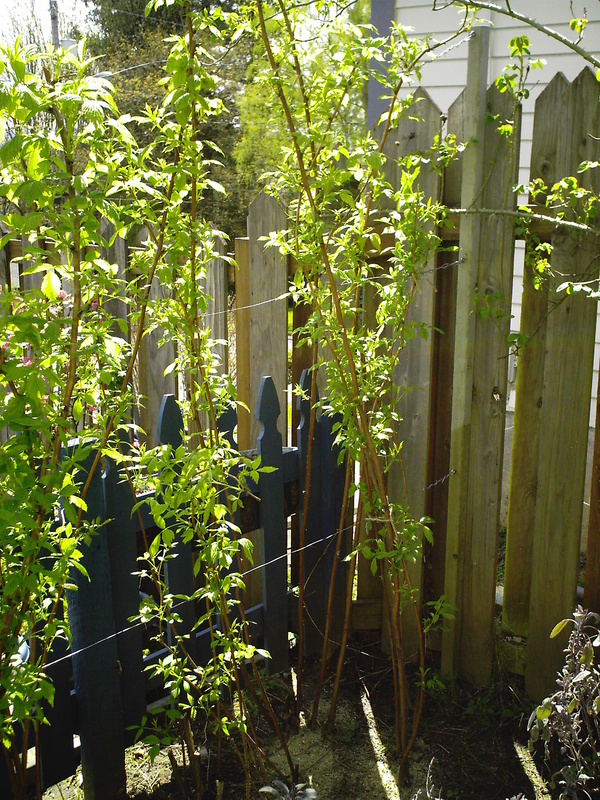 On the right are ‘Lochness’ thornless blackberry canes, with raspberries to the left. Don’t let the name scare you–it only gets as tall as the raspberries, and it truly is thornless. It has not been a heavy producer for me, however. But the flavor of the berries is great. So that’s it. 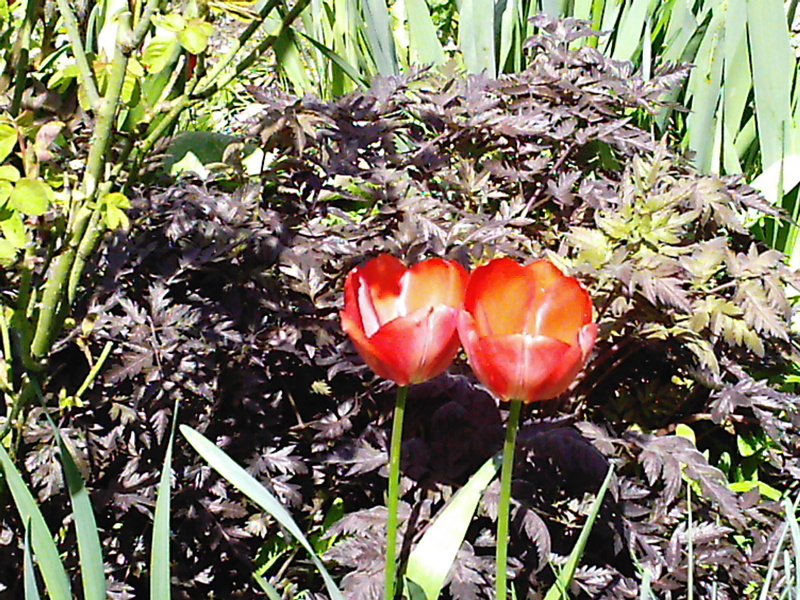 What’s new in your garden? Leave me a comment if you like. And visit the Garden Party. I’m super-busy right now so no time for a long and detailed gardening post. 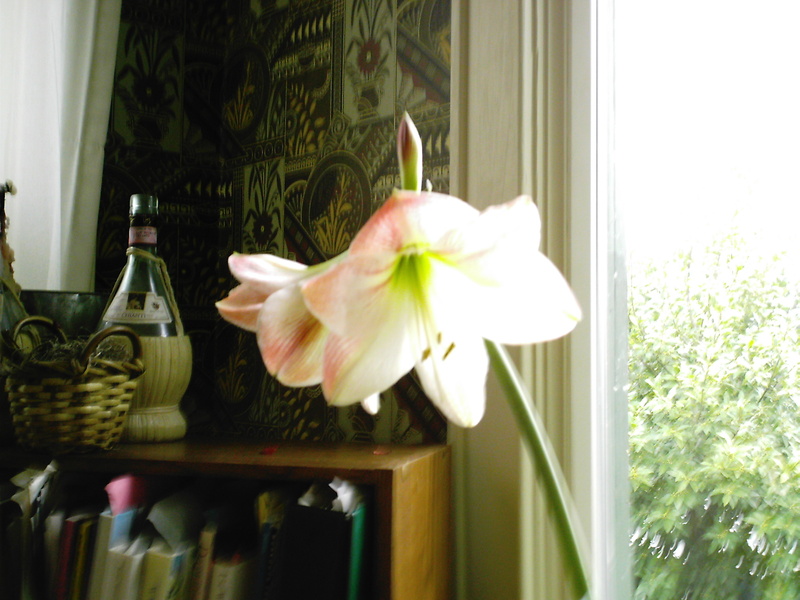 Instead, I took a few pictures of plants that are flowering inside our home at the moment. 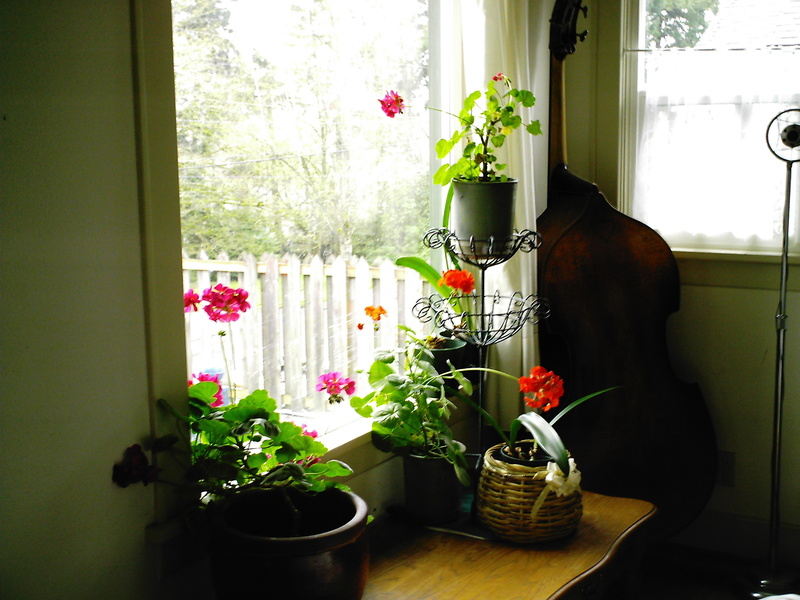 The amarylis is called “Appleblossom,” and the other picture shows three pelargonium, commonly and confusingly known as geraniums in bloom (there are plants that are true geraniums that are called hardy geraniums, and they will grow very well here outdoors), along with some assorted other amarylis that are hanging out in the southern-facing window and growing. The pelargonium I like to winter over inside under lights, so that I have flowers inside even during the cold winter months. I’ve tried leaving them planted outside both in the ground and in containers, and it just gets too cold here for them and they die, so inside they go in the fall before it freezes. I then use them in my outdoor containers and hanging baskets in the late spring and summer months, so they get to go outside and play, so to speak. And now a close-up . . . 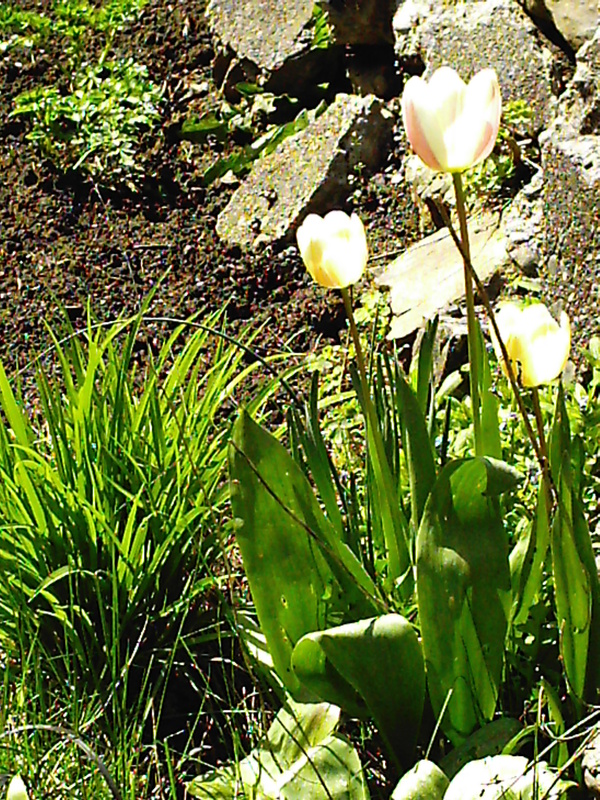 I have just the beginnings of tulips that are about ready to bloom outside, but just a few at this point. The rain and cool weather continues on apace . 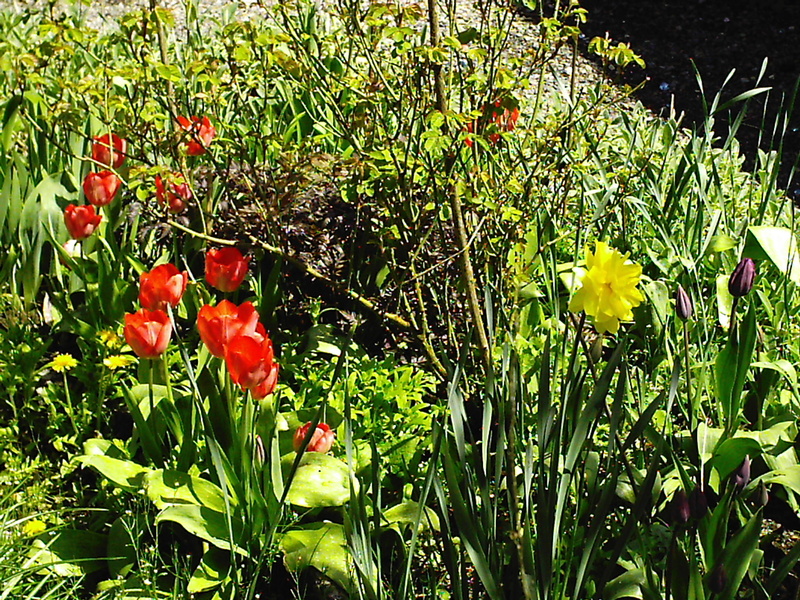 . .
What’s new in your garden? 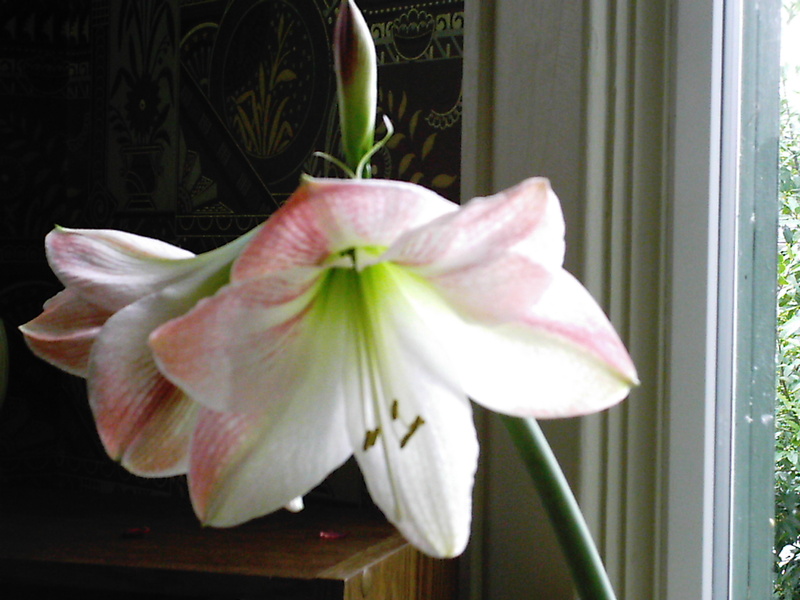 Do you have some indoor plants that are flowering now? Let me know in the comments.